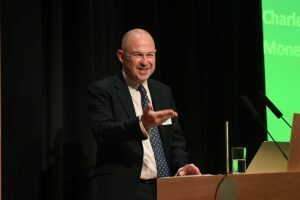 Opening speech given at the British Library, Knowledge Centre, 23 October 2018 by The Money Advice Service CEO Charles Counsell. It is my pleasure to welcome you to an event which represents the culmination of nearly two years’ work by the Money Advice Service and our partners across the sector – many of whom I am delighted to see in the audience today. In early 2016, when my colleagues at MAS first came up with the idea to build, gather and strengthen evidence of what works (and, equally importantly, what doesn’t) to improve financial capability in the UK, I doubt anyone envisaged we would be in such an esteemed venue as this, less than 24 months later. We have an ambition to ensure that our financial capability Evidence Hub contains every bit of relevant evidence and insight published in the English language. But, in my view, we could not be in a better place than the Knowledge Centre of the British Library. The library exists to build, curate and preserve the UK’s national collection of published, written and digital content, whilst stimulating research of all kinds. Through the fund, we have worked to build, gather and strengthen evidence of what works: by testing and piloting potential new solutions, scaling up financial capability interventions and evaluating existing projects across the country. Just as the library has a copy of every publication produced in the UK and Ireland, we have an ambition to ensure that our financial capability Evidence Hub contains every bit of relevant evidence and insight published in the English language. And, while the 55 reports we are discussing in detail today are somewhat dwarfed in number by the 150 million items housed in the building opposite, they have just as much merit in terms of the potential influence they could have on the future lives of millions of people around the UK. These are complex problems which can lead to widespread impacts on individual wellbeing, health and the UK economy. They cannot be solved by any one organisation working alone. 12.9m adults have no accessible savings to fall back on. We want everyone to save money regularly. because they are short of money. We want to see a fall in the number of people regularly using credit for everyday spending. Too many people are burdened with problem debt, struggle to manage their finances and don’t seek help. We want everyone who needs free debt advice to get it. The Money Advice Service launched a ten-year Financial Capability Strategy for the UK to bring many different people and many different organisations together to collaborate and take action. That is why The Money Advice Service launched a ten-year Financial Capability Strategy for the UK in October 2015; to bring many different people and many different organisations together to collaborate and take action to permanently address these issues and bring about lasting change. The What Works Fund represents The Strategy in action. The Strategy is designed to equip people with the evidence and expertise to change money behaviours. The What Works Fund represents The Strategy in action: funding the evaluation of interventions on the ground to make sure the specialists on the frontline make a difference. 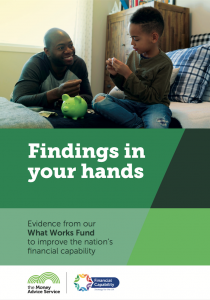 Before we started the What Works Fund, this type of work had not been undertaken within the financial capability landscape before and very little evidence existed. We estimate that millions of pounds were being spent on related financial capability interventions each year, without knowing for sure which interventions were the most effective in helping people manage their money better. So, we set out to put evidence at the heart of the matter. To do that, we turned to the What Works Network. Created in 2013 to ensure that the best available evidence on ‘what works’ is available to the people who make decisions on public services, the Network has now grown to include 10 independent What Works Centres around the country – looking at policy areas from policing to health. What Works is based on the principle that good decision-making should be informed by the best available evidence. If evidence is not available, decision-makers should use high quality methods to find out what works. We set out to put evidence at the heart of the matter. In two years we’ve spent over £11 million directly on 65 projects across the UK – from Belfast to Birmingham, and from Glasgow to Gateshead – directly helping over 40,000 people, and tripling the amount of UK-based evidence available. The 65 projects are incredibly varied across channel, beneficiary and evaluation design: beneficiaries range from young children through to people in retirement. Truly from pocket money to pensions. 26 of the projects were funded to scale up current interventions and improve the rigour of their evaluations. But over half of the projects were brand new pilots, and therefore conceivably would not have happened without MAS funding. Delivery methods spanned multiple channels and technologies: from intense one-to-one support right through to mobile app-based support. Whilst the projects vary, all of them have detailed robust evaluation plans in place, and were put through an intense development period in order to achieve the best results. Before issuing any grants, we worked with the organisations so they could develop their own project theories of change, evaluation methodologies and intended outcomes for their participants. We knew that the programme would need significant expert support to ensure the delivery of consistent, quality evaluation findings across the board – and we commissioned an evaluation and learning partner (ELP) to do this. Our ELP is comprised of Ipsos Mori, Ecorys and the Personal Finance Research Centre at Bristol University. It has given us an invaluable mix of flexible resource, financial capability knowledge and evaluation expertise. Kelly Beaver from Ipsos and Professor Sharon Collard from Bristol University are both presenting the key findings on behalf of the ELP at midday, I am looking forward to seeing how all the individual project pieces have come together to help form an overall picture of social policy learnings. Sharing the knowledge and insight that together we’ve gained, harnessing that community to translate learning to action, is the only way we will build at the scale we need. And if that was not enough, you are all going to leave the room this afternoon with the ‘findings in your hands’: a specially prepared summary which you can read discuss over lunch with colleagues from across the sector, and our grantees. I’m delighted that so many of our projects are represented in the room today. I encourage you to look out for the specially marked name badges, so you can discuss their work in more detail at coffee or during lunch. Some of them will be presenting on this stage not long after me: such as Young Money’s intervention to understand the impact of training teachers on the financial capability of their students, which has shown the importance of training the trainer, delivering significant positive impacts for both teachers and school children. Others may be familiar to you because they have already achieved some notable media coverage for their work: such as MyBnk’s KickStart Money initiative – which featured in the national press and gained support from several local MPs back in the summer. One of my first visits to a What Works project was seeing Angela McLachlan, Sharon Berrie and Alison Watson at Shelter Scotland‘s Healthy Finances Pilot in Edinburgh. The project aimed to engage with at least 200 at-risk people by establishing a presence in health setting across Glasgow and Dundee, encouraging them to tackle the source of the crisis, and working with them to co-produce a financial plan which sought to address their immediate financial problems and enhance their financial capability. In February, my Chairman Andy Briscoe and I, spent an afternoon in Wales at Tenovus Cancer Care. We funded Tenovus to scale up and evaluate an intervention to people affected by cancer to reduce their risk of falling into financial difficulty and debt problems owing to their diagnosis. They have now found funding to continue the delivery of financial capability as part of their core offer moving forward. More recently, I was in Northern Ireland to visit two projects being run by Advice NI. I was particularly struck by their Building Resilience in Retirement Project – which examined digital literacy, avoiding scams, online budgeting tools, comparison websites and accessing online money advice services for hard to reach people, with a focus on elderly men. The outputs from all of these projects, along with 52 others, are summarised in the ‘Findings in your hands’ booklet we will provide you today. You can also digest them in more detail online via the Evidence Hub, which has been reinvigorated in time for this evidence launch. Evidence is now being added on a weekly, and sometimes daily, basis. Indeed, the fund alone has added a further 50% more studies to the hub. It is all made available for the purposes of learning and sharing: enabling organisations to be effective in embedding evidence-based practice in public, private and not-for-profit sectors. Sharing the knowledge and insight that together we’ve gained, harnessing that community to translate learning to action, is the only way we will build the scale we need to really ‘move the dials’ on money management issues. Many of you will know that in January the Single Financial Guidance Body comes into being. While the Money Advice Service as a brand will continue for a while, its staff, functions and work will become part of the new SFGB. Looking at the Evidence Hub today, and reading all the quality research the Money Advice Service has helped compile and evaluate over the past two years, I am proud that we have a formidable body of work which the new organisation can build on. Using it to actively deploy its understanding in its own efforts in this area, and to share this knowledge and promote best practice across the industry. Future campaigns and interventions will be far more effective and far more efficient as a consequence. This research – when combined with wider insight and evidence – is what will enable us to identify what and how to deliver at scale to help people to make better financial decisions throughout their lives. The learnings from these projects will inform the investment decisions of the Single Financial Guidance Body, as well as other organisations and agencies that will look to fund the improvement of the UK’s financial capability for years to come. People’s lives will change as a result. For that contribution, I want to thank the Money Advice Service Board and staff for their tireless work, but I also want to thank all of you for coming on this journey with us, and for coming to share your learning, enthusiasm and ideas today. We now have enough evidence to begin moving into action. But the work does not stop here. This may be the beginning of the end for the Money Advice Service, but it is not even the end of the beginning for the Financial Capability Strategy and finding out What Works to improve money management in the UK. We need you to invest in new evidence-based research. We need you to take on our methodologies and use them to develop new practices. We all agree that we cannot go on with a situation where nearly 17 million people have less than £100 in savings. We all agree that we cannot go on with a situation where one in five of us cannot read a bank statement – and many are too worried about what is inside to even open it in the first place. We all agree that we cannot go on with a situation where 8 million of us live in the shadow of problem debt. To solve these problems, we will need your help. We need you to invest in new evidence-based research. We need you to take on our methodologies and use them to develop new practices. We need you to use the ‘findings in your hands’ to help engage new partnerships and undertake new evaluations. This approach will span many years, but each year we will learn a bit more, add to the evidence base, and step by step begin to build the picture of what works to make a real difference to the financial lives of people throughout the UK.